The advanced direct read formaldehyde monitor from PPM Technology. The Formaldemeter 400 is an ultra compact, truly hand held instrument that can provide a rapid indication of hazardous airborne formaldehyde levels at the touch of a button. The Formaldemeter 400 offers a simple way to monitor levels of airborne formaldehyde in the workplace. The instrument has been designed with ease-of-use in mind, being operated via a simple four button keypad and featuring an easy-to-read four-digit display. The Formaldemeter 400 uses a well proven electrochemical formaldehyde sensor that will provide an immediate indication of atmospheric formaldehyde levels. Hold the instrument in the atmosphere to be analysed. The formaldehyde concentration is displayed in parts-per-million (ppm) in approximately 8 seconds. Phenol Filters: Complete removal of contaminants such as phenol and resorcinol can be achieved by attaching PPM Phenol Filters to the sampling port of the instrument. The data in table 2 show their effectiveness on the Formaldemeter II. 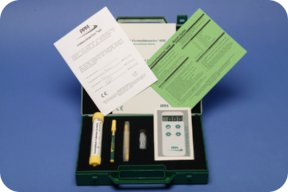 Calibration Standard: PPM supplies an easy-to-use formaldehyde calibration standard tube for checking and adjusting the calibration of the Formaldemeter 400. The tube produces a known concentration of formaldehyde vapour that can be sampled by the instrument to check accuracy and performance. The standard has a 100-sample capacity or a useful life of six months (whichever occurs sooner). 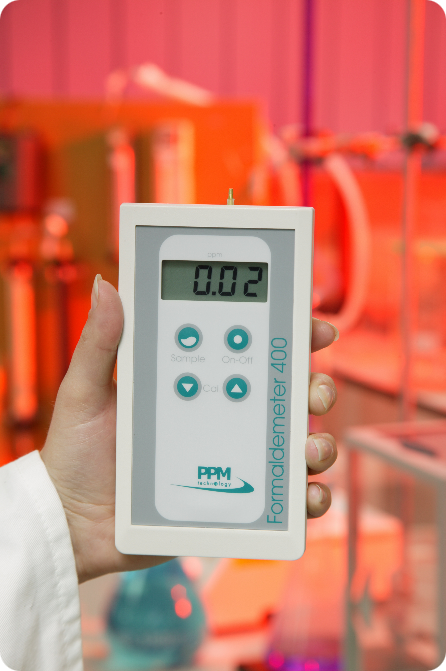 PPM AMS-2 Aldehyde Monitoring Station: The PPM AMS-2 enables the Formaldemeter 400 to be used as a data logging semi-continuous formaldehyde area monitor. The AMS-2 is a compact bench top unit that connects to the hand held instrument and essentially automates the operation of the Formaldemeter 400. Single / Multi Point System: The Single / Multi Point Monitoring System enables formaldehyde monitoring to be carried out at one or more location simultaneously. Several monitoring points can be connected to the system and monitored at a central location via one PC. Accuracy of Formaldemeter ( F ) versus the Modified NIOSH ( N ) Method. Comparison of Sample Results at 21.5°C from Formaldehyde (0.5g/l) and Phenol (80g/l) Mix. All concentrations in ppm, formaldehyde concentration 2.7ppm. Ref: BTTG Shirley Technology Centre. * Formaldemeter 400 now discontinued. See Formaldemeter htV for an alternative monitoring solution.